Diarrhea is an increase in the frequency of bowel movements, an increase in the looseness of stool or both. Diarrhea is caused by increased secretion of fluid into the intestine, reduced absorption of fluid from the intestine or rapid passage of stool through the intestine. Diarrhea can be defined absolutely or relatively. Absolute diarrhea is defined as more than five bowel movements a day or liquid stools. Relative diarrhea is defined as an increase in the number of bowel movements per day or an increase in the looseness of stools compared with an individual’s usual bowel habit. 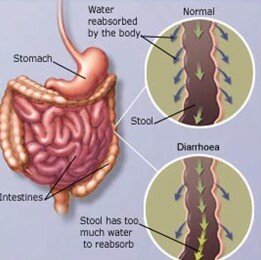 Diarrhea also happens when being in contact with someone else who has it, or may get it from food poisoning after eating the contaminated food or drinking contaminated water. Diarrhea may be either acute or chronic, and each has different causes and treatments. “Acute Diarrhea” is that which comes on suddenly and lasts for not more than a couple of days. Acute diarrhea recover on their own. “Chronic Diarrhea” lasts for more than two weeks. But this condition requires medical care to find the underlying cause and treat complications, such as dehydration. The length of time diarrhea lasts often depends on what caused it. Diarrhea from norovirus lasts around two days, for rotavirus, the duration is three to eight days, Campylobacter and diarrhea from giardiasis can several weeks. A bacterium, such as coli or cholera (Vibrio cholerae). A parasite, that causes giardiasis and amoebiasis. Inability to digest certain foods, including a lactose intolerance (difficulty digesting the type of sugar found in dairy products); coeliac disease (an intolerance of gluten in wheat and some other grains); and pancreatic problems which interfere with production of important digestive substances. An increase in bile in the colon can result in watery stools. Inflammation in the intestinal tract, which can result in chronic diarrhea. If there is inflammatory bowel disease. Irritable Bowel Syndrome, which may cause alternating bouts of diarrhea and constipation. Bowel cancer produces a change in bowel habit that may include diarrhea or alternating diarrhea and constipation. Toxins such as insecticides, psychedelic mushrooms, and arsenic can cause diarrhea, and overuse of caffeine or alcohol may contribute to diarrhea. The most important way to avoid diarrhea is to avoid coming into contact with infectious agents that can cause it. This means that hygienic food preparation and storage techniques, and good hand washing, especially when preparing food and after using the toilet are very important. Disinfectant the toilet, handle and the seat after the person has used it each time. Don’t share towels, flannels, cutlery or utensils with the person who is unwell. Keep them at home until at least 48 hours after the last episode of diarrhea. The most important aspect of treating diarrhea involves avoiding dehydration and replacing lost fluid. Because plain water does not contain sugar, sodium or potassium, which is also lost in diarrhea, it is important to consume plenty of fluids that contain these substances. Examples of appropriate drinks include water, prepared re-hydration solutions, Vegetable soup. Fresh Fruit juice or drinks can make diarrhea replace the lost substances in adults. If you also are vomiting, try taking tiny amounts of liquid every 15 minutes. After able to hold down liquids, one can take bland, soft diet. * Avoid fats, sweets, coffee, and milk products until you are completely recovered from diarrhea.